Recently i noticed that I (and everyone else) could not add new information to my website. The issue affected everything. New support forum posts were getting rejected, you could not save online calculations and even automatic payments were not saving in my online database. 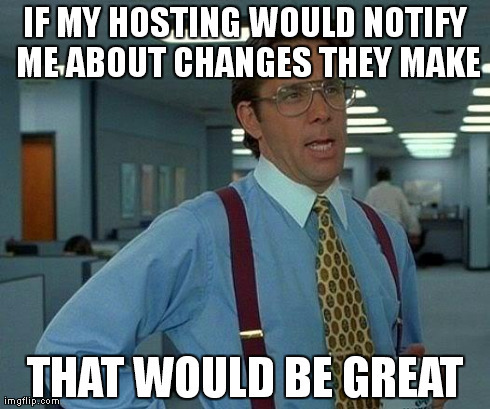 Turns out my hosting (the company that hosts my web sites on their servers) changed a bunch of settings from their end. This caused all the issues many may have been experiencing. Now everything has been fixed. In fact it only took me half an hour to fix things, but 3 days webservices were immobilized until i noticed the problem. I also made some changes to HSMAdvisor program. In version 0.811 i have fixed an annoying glitch that crashed the progam when less than 3 days were remaining on the trial. It did not affect paying customers, but i guess it cost me a few of potential ones. I guess it is another drawback of releasing updates as often as i do.